Recorded by unknown at the University of Washington, HUB Auditorium, Seattle, Washington 15 March 1986 ; concert co-sponsored by the UW Ethnomusicology Division and Ragamala. Original digitally processed audio recording made with Panasonic PV-9000 VCR, Sony PCM-F1, PZM mics. Mastered & Cut by Rashad Becker at Dubplates & Mastering 1117 & 0318. Liner notes by Renaud Brizard, edited by Ian Christe. Front and back cover photos by Niranjan B. Benegal, Seattle Center Folklife Festival 1979. Elizabeth Reeke & Annie Penta on tanpuras. Inner gatefold photography by Niranjan B. Benegal & Ira Landgarten. Around ten years ago, deep into a cozy and hazy night following a concert with my sound brothers Daniel O’Sullivan and Kristoffer Rygg in London (as Æthenor), they graciously introduced me to a recording of rudra veena (a kind of noble deeper bass relative to the sitar, in a way) as performed by dhrupad master Zia Mohiuddin Dagar. Dhrupad, for those who do not know, is a branch of Hindustani classical music said to "show the raga in its clearest and purest form". It's pacing concentrates heavily on the slow, contemplative alap section and works with specific microtonal gestures and deep characteristics of resonance ... in short I was hooked on this new (to me) and ancient form of music from the first listen, and feel that a more or less continual listening & reviewing of Zia Mohiuddin Dagar’s recordings in the years that followed have influenced my own approach to music quite heavily (if, albeit, indirectly). In early 2015 I was able to make contact Zia Mohiuddin Dagar’s son Bahauddin and some of his American students/disciples, primarily Jeff Lewis. Over time we developed a friendly and educational exchange, access a massive archive of recordings and developed these two paired titles for my label. It’s been a long path to arrive at actually releasing them but also probably in many ways one of the most significant releases I’ve worked on. And I’m proud to be able to reveal these to date unreleased archival recordings of one of the masters of dhrupad, Z. M. Dagar, to the public for the first time. 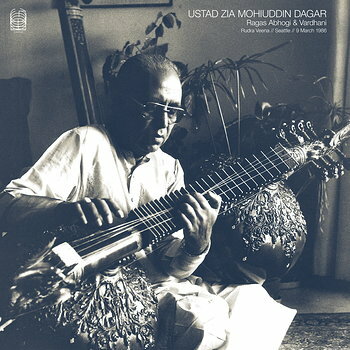 Zia Mohiuddin Dagar was the nineteenth generation in a family tradition known as Dagar gharana, a rich lineage which continued and performed the musical form of dhrupad (Bahauddin Dagar continues the lineage as a master rudra veena dhrupad player of note today). Initially, dhrupad was a rigorous, austere, devotional genre that was sung in Hindu temples. But between the 16th and the 18th centuries, it became the preeminent genre in royal courts in North and Central India, and the Dagar gharana developed and continued publicly following the eventual loss of court patronage for dhrupad in the 19th century. The French ethnomusicologist Renaud Brizard covers the story of Zia Mohiuddin Dagar's life and teaching (a long story also in Seattle, my hometown! ), the Dagar family and gharana, the rudra veena and more topics in an extensive set of liner notes in this release. Raga Yaman was recorded at a public concert in Seattle at the HUB Ballroom at the University of Washington in March 1986 (the week after the accompanying release SOMA028 Ragas Abhogi & Vardhani was recorded) at the end of his last tour of the United States. Yaman was a special raga for Zia Mohiuddin Dagar, one of his signature raags. For centuries, Yaman has been considered as one of the most fundamental ragas in Hindustani music and is one of the first ragas which is taught to students. A deep knowledge of Yaman gives a key for understanding many other ragas. It's filled with tranquility, contemplation, pathos and spiritual yearning.